I closed this book with one main thought: it was alright. For a book that has quite a few five star reviews it wasn't the reaction I was expecting from myself, or the reaction I was particularly hoping for, but there you go. The Tenderness of Wolves is a difficult book for me to review because I didn't dislike it, but I'm not entirely sure if I liked it either. First of all, this is a great read for January. The wintery Canadian setting is ideal for this time of year, which just so happens to be when Britain gets really bloody cold. It was nice to read a book set in Canada, too; I don't know how many books I've read that are set in Canada, but I'm pretty certain I've never read historical fiction set in Canada. Though there's a crime in this book, I don't think I'd describe it as crime fiction, and despite its 19th century setting it felt more like literary fiction to me than anything else. This isn't a bad thing; some sections of this book were written beautifully, there was a lovely section towards the end that didn't make me cry but definitely touched me, but then there were others which felt overwritten. 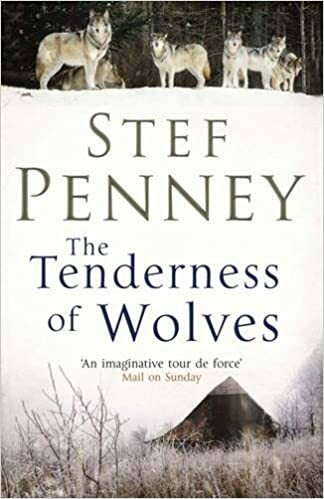 Sometimes I felt Stef Penney's presence too keenly, like I could see her there trying to pull the strings and saying 'look how deep and meaningful this bit is', and it felt forced. The biggest problem with this book for me was simply that Penney tried to include too much. There are so many different characters and storylines in this book, and while they do all fit together, and parts of it are quite clever, there was just too much. I got about two thirds of the way through the book and I was starting to get bored because the story felt, to me, like it was dragging; with each new character Penney introduces we get their life story, and while I did get the sense Penney was really writing about a community of people rather than just one story, I felt like there were quite a few scenes that easily could have been cut. The problem with books like this is that there are always some characters in an ensemble cast that you don't like, so when it comes to reading their chapters, however small, it's boring. I've seen quite a lot of reviews claiming that the ending is too abrupt, that there are characters we just don't see again, but I didn't get that feeling. Yes this book has a big cast and some of them you don't realise you won't see again until the book closes and you've yet to have another scene with them, but considering I'd already gotten everyone's backstories I didn't feel like I needed to know what happened to all of them afterwards, too. For most of the characters it's fairly obvious what will happen: life will go on, they don't need to spell that out for us. Though the ending is probably realistic, I personally found it a little unsatisfying. In some respects it's a very quiet novel - it reminded me a little of Year of Wonders, in that they're both slow-moving stories about whole communities - so in hindsight I know I shouldn't have expected an 'unrealistic' ending, but because it begins with such a brutal murder and includes lots of other themes - from asylums to homosexuality to the possibility of an ancient Native American language - the ending wasn't what I'd hoped for. I wanted it to go out with a bit more of a bang, but instead it just... ends. One thing I did love about this book was the inclusion of several Native American characters; I feel like I come across Native Americans in fiction, film and television far too rarely, so I always enjoy it when they appear. Parker, in particular, was a lovely character, and probably my favourite character in the book. I don't think my thoughts have come out very coherently here at all, but I'm struggling to make sense of them myself. This is particularly frustrating considering I actually tried to read this book once before and ended up putting it down because I couldn't get into it; this time around I was really enjoying it, and then the more it dragged and the more characters who joined the cast, the less I began to care. Ultimately I think whether or not you like this book really does depend entirely on your tastes; if you like slow-moving, character-driven, bittersweet stories then there's a good chance you'll really enjoy this. I enjoyed reading it, but on the whole it's not something I could see myself reading again.